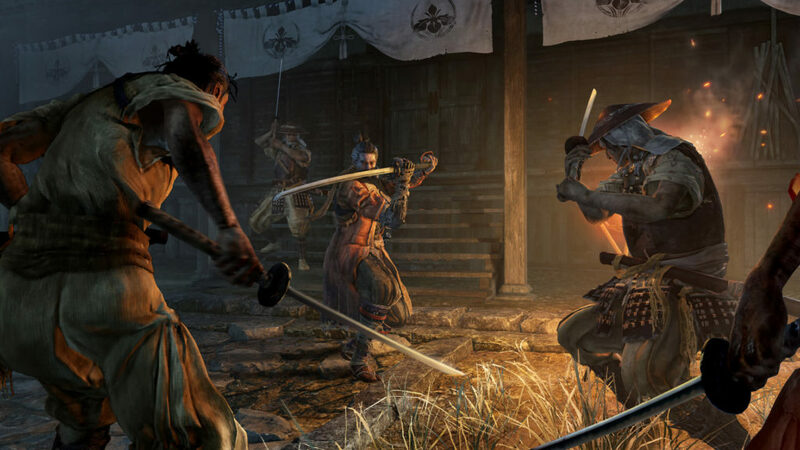 The newest hit from the developer, From Software, comes the ninja-themed game, Sekiro: Shadows Die Twice. This is the same team that introduced the world to the ultra-difficult, Dark Souls. So, by easy comparison, Sekiro should be just as difficult, right? Well, this question is a double-edged sword – if Sekiro is as difficult as previous entries made by From Software, is the game also enjoyable? The short answer to these questions is yes, Sekiro is difficult, but it is also enjoyable to play. Let’s get all the characters and story out of the way so we can get to the meat of the game. This story takes place in Sengoku Japan. 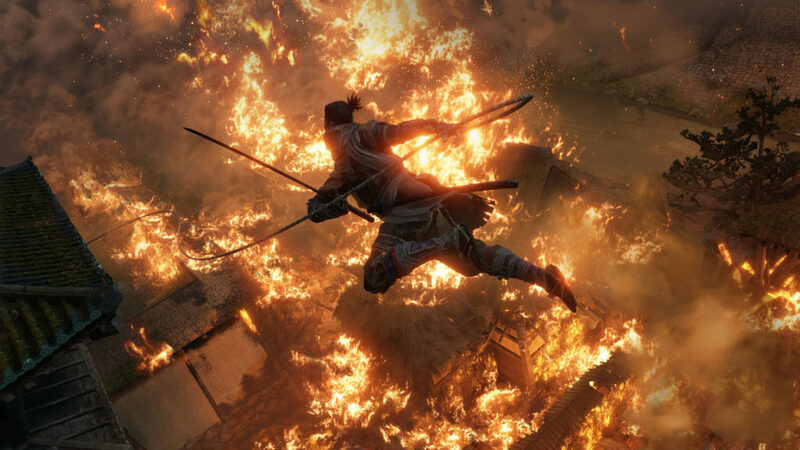 In land of Ashina, a war has exploded, and people are being slaughter. A warlord by the name of a Genichiro, wants to not only seize the land of Ashina but kidnapped the young lord. There is something special about the tribe of the Ashina clan, and the young lord is the key to it all. Players will play as the disgraced shinobi, The Wolf. Left for dead after being orphaned in the war, Wolf was picked up by another Shinobi by the name of Owl. Wolf shows no fear in the face of death, so Owl decides to mentor him. Years pass by and Wolf grows up to become a shinobi. Then during a rainy night, a small group of soldiers decide to attack the home of the Divine Heir Kuro. Things turn south and Kuro is taking hostage and it is up to Wolf to rescue Kuro. The feeling of disgrace and failure is too much for Wolf so he will do whatever it takes to get Kuro back. Wolf finds out where this group is keeping Kuro and sets out to rescue the young man. Things seem to be getting better as Wolf successfully rescues Kuro, only to be met by Genichiro. Wolf and Genichiro jump to battle, only Genichiro is too much for Wolf. In a short battle, Genichiro swiftly defeats Wolf and severs his arm and leaves him for dead. Wolf wakes up some time later inside of a temple. He now is in the possession of a prosthetic arm and a strange old man, who only has one arm. The strange old man goes by the name of the Sculptor, and he worships buddha. After some discussion between the two men, it turns out Wolf cannot die. Well, he can be killed, but he will be resurrected. This is when the game takes off and the journey of Wolf to find and rescue Kuro begins. Sekiro was developed by From Software, this is the same team that brought us the Dark Souls series. So, you can only imagine that this game is going to be super difficult. 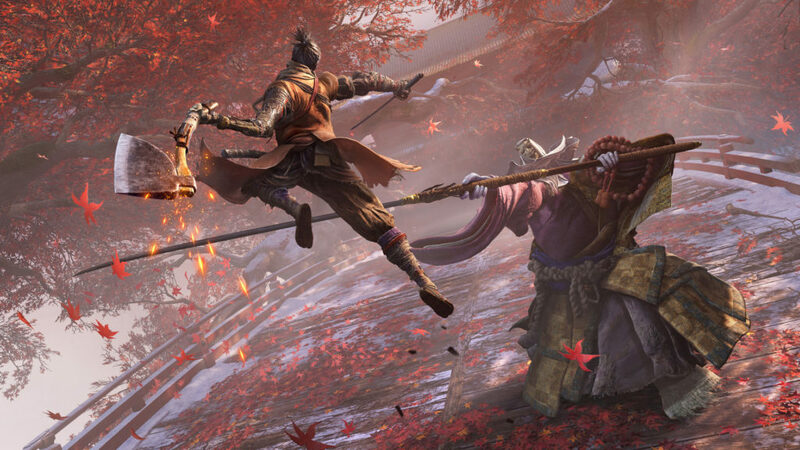 Well, there is some good news and there is some other news – Sekiro is not as difficult as Dark Souls, but it is still a rather difficult game. The Wolf can run, slash, jump, swing, all while trying to either duck, dodge or block an opponents’ incoming attacks. This is where the skill comes into play. Each opponent, as well as Wolf, has a skill called Posturing. Posturing is the amount of hits or blocked attacks an enemy can withstand. The same goes for The Wolf. Each time a player blocks an opponent’s attack, it raises the posturing level. If the enemy is overwhelmed and Wolf breaks the posture, Wolf can strike with a one-hit kill. However, Wolf can strike an opponent to death, but often times this can prove to be rather difficult if there are multiple enemies or a player is facing a strong enemy. Players will need to use an arsenal of moves and weaponry at their disposal in order to win the fight. Aside from Wolf’s sword, he is also been outfitted with a prosthetic that can be used as a weapon. Throughout the game, Wolf will come across different power ups that will enhance the prosthetic. One upgrade turns the wooden arm into a flame thrower, while another will have fire shurikens at Wolf’s enemies. It is going to take every bit of ingenuity to get past the enemies in this game. Sekiro is a stunning game. The graphics are amazing and you can tell a lot of work went into the presentation of this game. Form Software has created another hit franchise. There are a lot of little details that just make this all that more immersive. For example, when enemies can’t reach you, they will throw bottles of oil at you. This oil coats the Wolf in weird ways, never quite coating him the same as previous times he has been hit with oil. The amount of times Wolf dies also impacts the game, in a negative manner. Characters in the game will catch dragonrot. A disease that starts off as a cough, but will eventually overcome its victims. Each time Wolf dies and he is resurrected, the disease grows. So now players aren’t only being punished by losing half of your money and experience, they are also killing the supporting cast. Sekiro is like a double-edge sword. Some times I can fire up the game and play for hours on end. Other times, the level of frustration can cause me to quit playing in under 30 minutes. I have spent a fair amount of time watching how-to videos as well as reading up on guides for the combat in Sekrio. Players will need to be patient and learn the rhythm of the enemies. There are ways to farm enemies so that players can earn experience before moving into a new area. I would highly recommend taking this approach. While this game is magnificent, it is not going to be accessible to everyone. There is a steep learning curve and be prepared to die. Be prepared to die a lot, but the level of satisfactions after defeating a difficult enemy is worth it in the end. This game has a great story and awesome presentation, but it is not for the weak-willed or faint of heart. From Software has another hit game, but some people may miss out on this gem because of the difficulty.